A press conference was today held at Ipurua to present the current status of the SD Eibar electoral process, which reaches its conclusion on 1 June with the staging of the General Shareholders' Meeting, at which the 13 members of the new board of directors will be elected. 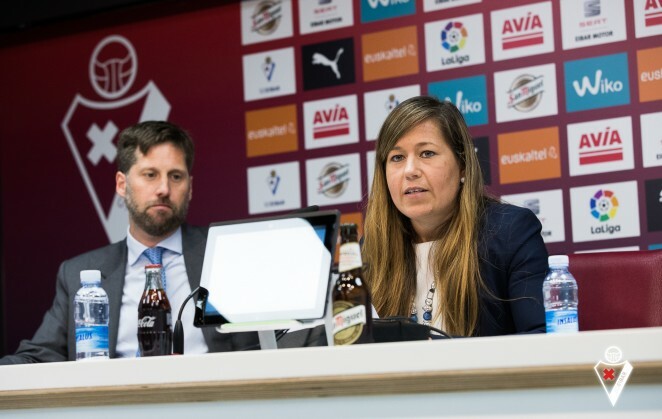 Addressing the gathered media were SD Eibar's general manager, Patricia Rodríguez, who was accompanied by Javier Romero Girón, a partner at Garrigues legal firm and the club's lawyer. The aim of the press conference was to reveal the progress that has been made since the previous public appearance held on 12 April, at which the dissolution of the Electoral Process Organisng Committee was announced. During the course of the last month, documentation has been sent out to the shareholders to the addresses with which the club were provided. An accreditation, proxy and voting card featuring the shareholder's details. An instruction sheet regarding the electoral process. A pre-paid envelope to return the proxy to the Eibar Notary (optional). Leaflets about the three candidates running in the elections. Last week saw a meeting held by the Follow-up Committee, which is made up of a member put forward by each candidate who signed the agreement and Patricia Rodríguez. The documentationhas been sent out to the shareholders. An update with regards to the use of the club'sfacilities carried out by the candidates. Announcement thata new set of informationhas been sent out by one of the candidates. The option of submitting proxiesin advanceto the Eibar notary. This section of the website, which is currently operational, features all of the information relating to the elections, as well as some illustrative videos of each of the key steps within the electoral process. "We're aware that the process could well be seen as being acomplex one and therefore, in addition to the videos and the aforementioned section of the website, this Sunday will see instructions to assist with the completion of the attendance card published in the main local media", revealed the club's managing director. To facilitate the accreditation process of thelegal entities,an email address has been made available to the shareholders which they can use to delegate their powers to the companies in advance, so as to allow the notary to carry out advance checks. The email address is: garciasillero@notariado.org. This email address is accessed solely by the notary. As those cases involvingminors, there is also the option to send a copy of the family book in advance to the same email address. To be accredited on the day of the meeting, attendees must present a valid national identity documentor passport. The whole accrediation process will besupervisedat all times by the notary, María Dolores García Sillero. Those shareholders who are not going to attend the Meeting in person have the option to delegate the representation of their shares toanother personwho is set to attend (who may or may not be a shareholder). In order for the proxy to be correctly carried out, the shareholder has to completethe final page of the card which was sent to their home address with their own details in the first series of blank spaces and the details of the person they are delegating their representation to in the blank spaces below this. For the proxy to be considered valid, the accreditation, proxy and voting card must be accompanied bya photocopy of the national identity card or passport of the person granting the proxy, whilst the proxy holder must attend the Meeting with their own physicalnational identity cardor passport. Those wishing to delegate their representation are able to issuevoting instructionsby filling out the voting section or they may leave it blank and delegate their vote to their representative. Thesubmissioncan be made to the Eibar notary using the pre-paid envelope provided, by handing it in to the Eibar notary in person or to the representative set to attend. Votes may be cast on a group basis (to one whole candidacy) or individually (to a maximum of 13 candidates). Only one of these two options may be used and never may the two options be used simultaneously, which would constitute a void vote. "The club is aware that this is a new system and it may represent a certain level of difficulty. What we're trying to ensure is that all of the shareholders are able to caste their vote without having any doubts. In view of this, the club offers itself to respond to any queries which may arise. They can telephone us, drop us an email or call in at the club. This is an important process and the club wants the shareholders to be able to vote with complete peace of mind", insisted Rodríguez.